Located: Approximately 1.5 miles south of S.R. 84/595 on west side of Hiatus Road. 2016 sales - 12 homes ranging from $840,000 - $1,650,000. The community of Long Lake Ranches West was announced in October 2003 by the builder GL Homes, construction started in early 2004. 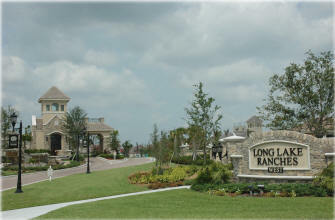 Long Lake Ranches Weston consist of 131 homes and is located just west of Long Lake Ranches across Hiatus Road. Over 3/4 of the community offers waterfront lots. There is a spectacular clubhouse and recreational facility that includes tennis & basketball courts, exercise room, social and conference areas and a party pavilion near the tot lot. Long Lake Ranches West differs from Long Lake Ranches in that it offers similar lot sizes, however the difference is that the lots here are wider but not quite as deep. The wider lot allows for more spacing between the homes, which many feel make the models appear much grander in size. The community is bordered by Equestrian/Hiking trails, and backs to the 160 acre Robbins Park which offers vast open space, equestrian trails, play area, picnic gazebo’s and more. If you are looking for a home for sale in Long Lake Ranches West call Ski as he can certainly show you any listed home in Long Lake Ranches West, and we usually have a list of homeowners who are interested in selling their home but do not have it listed. 3,832 a/c sq.ft. - 4,998 total sq.ft. 4,592 a/c sq.ft - 5,929 total sq.ft. 4,896 a/c sq.ft - 5,926 total sq.ft. 5,186 a/c sq.ft - 6,249 total sq.ft. 5,780 a/c sq.ft - 7,140 total sq.ft.